FOR RELEASE: Are you ready for baby animal cuteness overload? Check out Baby Animal Days at Centennial Village, 1475 A St., Thursday, April 19 through Sunday, April 29, 10 a.m. to 3 p.m. each day. During the event, families can interact with various baby animals such as pigs, lambs, chicks, ducks, goats and rabbits. Some of the animals reside in the museum’s Centennial Barn throughout its regular season, and some of the animals are visiting just for this special event. The annual event happens rain or shine and admission is $3 per person, ages three and older. New this year, visitors can also enjoy wagon rides, weather permitting, April 21, 22, 28 and 29. 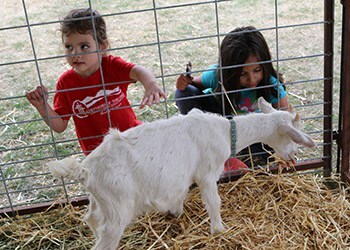 Baby Animal Days takes place in the western portion of Centennial Village and although the historical buildings are closed, visitors are welcome to meander the Village’s paths, check out the museum’s cell phone tour and enjoy the gardens. Agfinity, a local agricultural cooperative, is Centennial Village’s season sponsor and provides feed for the animals throughout the season. For more information about this event, call 970-350-9220 or visit GreeleyMuseums.com.